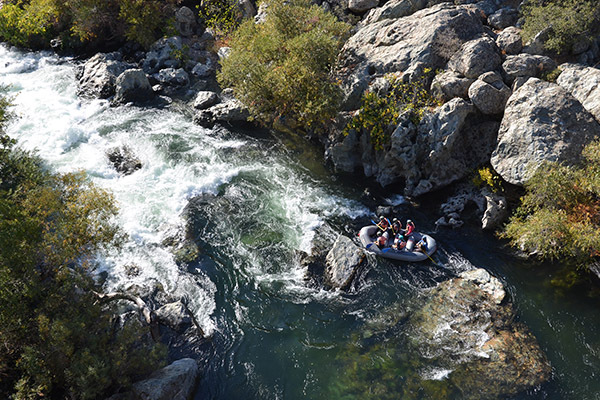 Tucked away from sight among the golden rolling foothills, Goodwin Canyon on the lower Stanislaus River is a steep-walled lush volcanic slot canyon featuring fun Class III rapids and two Class IV rapids. 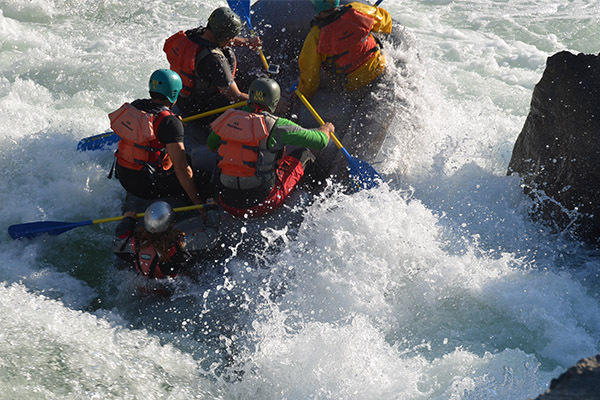 Only a handful of rafters get to experience this unique whitewater rafting trip each year. Considering some of the names of the rapids on the Goodwin Canyon, you may think the river flows straight out of Disneyland! The rapids are enjoyable and fun, something Walt might consider a good addition to the Magic Kingdom. There are a couple (Mr. Toad's Wild Ride and Haunted House), that are challenging, unpredictable, and provide an awesome adrenaline rush! There is no cable or tract under our raft guiding us along... just current and wild water! Goodwin Canyon sits at a low elevation of just 350 feet in the Sierra foothills about 20 minutes east of the small town of Oakdale and minutes from the historic, quaint town of Knights Ferry. The river runs through a beautiful, steep and narrow volcanic gorge, full of lush willows and tall cottonwoods native to California. Waterfalls created from irrigation canals above the river frequently cascade into the river creating a lush setting reminiscent of tropical islands. 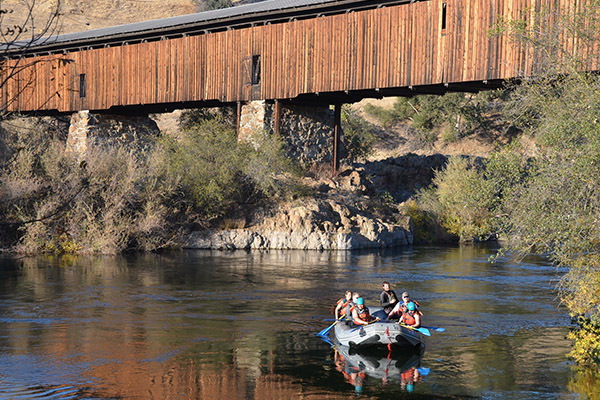 We raft under a covered bridge at the end of the trip which is the longest of its kind west of the Mississippi. Goodwin Canyon is one of the most diverse and interesting canyons in California and rafting is one of the only ways you can experience it. Since there aren't any other outfitters offering regular trips on this river, your group will most likely be the only one on the water. 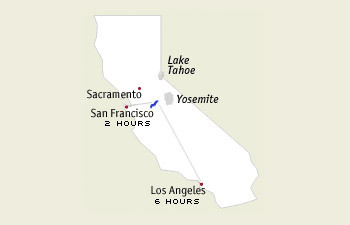 Only 1.5 to 2 hrs from San Jose & San Francisco! Goodwin Canyon is the closest whitewater to the Bay Area. It is located just 75 miles east of Dublin, near the small, quaint town of Knights Ferry off Highway 120. 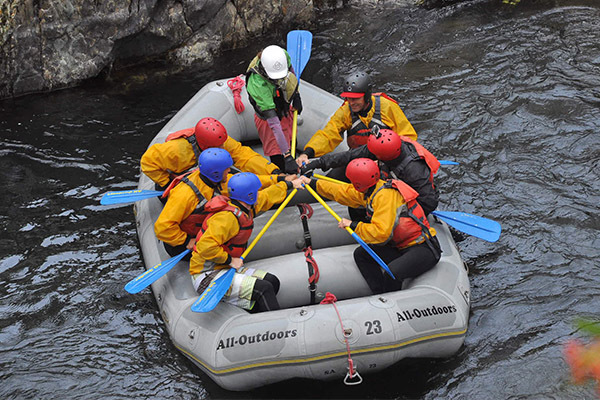 You could leave the comforts of your home and be at the river an hour and a half later... that's convenient rafting! Whitewater rafting in Goodwin Canyon is controlled by an upstream reservoir. During normal years water is released from upstream reservoirs for two weeks in September or October for the sake of the salmon fishery that thrives in the canyon. There is usually a window of raftable water releases during the spring snowmelt as well, however we don’t always raft this river in spring time. In years of heavy snowpack more water is released for the salmon and flows are consistent from April to October, 7 days a week. 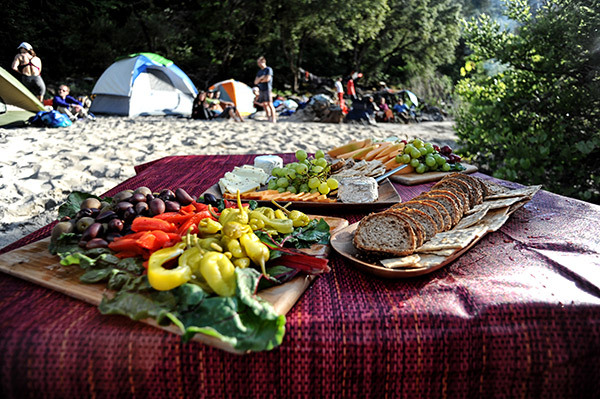 On our 1-Day trips our lunch begins with tortilla chips, salsa, and fresh summer fruits. Our gourmet "build-your-own" sandwich bar includes all the fixings needed to assemble the perfect sandwich to your preference. We also provide a beverage, and cookies to finish it off. Our Goodwin Canyon Double Days itinerary features a BBQ hot sandwich with side salads. All-Outdoors runs paddle raft trips on Goodwin Canyon. In a paddle raft, each guest and a professional guide have a paddle and navigate the river, working as a coordinated team. Goodwin Canyon trips are highly participatory so guests need to be ready and willing to paddle. All guests should be able to swim. Glad I talked myself into rafting Goodwin Canyon!!! "Beautiful day on a fantastic stretch of river. Many thanks to the AO crew for a fun-filled and thrilling day...along with a yummy lunch! Would recommend this trip to those willing to paddle for a very special experience!!"